The diagnosis was cold and cruel: "Your baby has athetoid cerebral palsy," doctors informed Iris Goldner, as she cradled her infant son Erel. "He will never walk, never talk or feed himself, become toilet trained or be independent in any way." And indeed, their dire prediction turned out to be quite correct—until the day three years later that she enrolled Erel at Meshi. Defying the doctors and even their own initial pessimism, Meshi's staff began an intensive, multidiscipline program of therapies to fortify his muscle tone and to establish communication with the sad, mute, completely helpless toddler. The results were astounding. "We gave top priority to breaking through to his silent world," recalls kindergarten teacher Tovie Mendlowitz. "Our speech therapists created a personalized ‘communications board' for him with pictures of people, activities, and feelings that related to Erel's world. Once he grasped the concept, he began using the board to signal to us, interacting and expressing himself for the first time. Very soon he mastered the specialized ‘talking' computer we gave him, which helped him reveal—to our surprise, I'll admit—his above-average intelligence and boundless spirit." 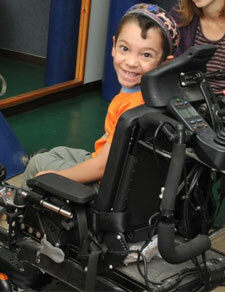 A similarly dramatic, unexpected breakthrough came at the onset, when Meshi physical therapist Ronit Aviram determined that Erel could be trained to walk. CP had robbed his muscle tone of the ability to sit or stand upright, and he suffered from hypertonia, causing uncontrollable spasms in his limbs. To this day, his right hand is wasted, and his limbs are prone to jerky lunges. Yet through painstaking, rigorous physical therapy, it was at Meshi that Erel eventually took his first steps. "I burst into tears at the sight," says his mother, Iris. Today, at age six, Erel is the uncontested star of his Meshi kindergarten class. Indoors, he walks independently with the aid of canes and a protective helmet, and outdoors he operates his power wheelchair with skill, precision, and great aplomb. He also steps in and out of the wheelchair on his own, all thanks to extensive physical therapy, including "TheraSuit" treatment pioneered in Israel by Meshi. Erel has now returned his talking computer, since his very concentrated speech therapy has enabled him to begin to speak. Although he is still quite difficult to understand, he's making steadfast efforts to improve. Exhaustive occupational therapy sessions have given him the skills to eat a complete fare of food independently, using a fork and spoon (when he arrived, his diet was restricted to liquids and spoon-fed yogurts). Occupational therapy has also enabled him to become completely toilet trained. In kindergarten, he's learned to read, to write and to tell time. And, with the help of his therapists and Meshi's specialized computers, he's mastered computer skills to let him draw and express the many fine details of life that he's observed and learned, but has trouble enunciating. "Whatever challenge we give to Erel, he throws his indomitable spirit into with zeal," says teacher Tovie Mendlowitz. "He just doesn't give up." Yet Meshi's director of professional staff Shlomit Kahan is concerned with the emotional hurdles that lie ahead for Erel. "Complications will arise when Erel eventually joins society at large. Will people be patient enough to accept this adorable child—and others like him—who is so communicative and so friendly, but whose body and speech will always be limited? We'll help him reach his maximum potential, and more. But he'll need a great deal of emotional support to accept the barriers that his limited speech and his spastic body will undoubtedly place before him." Erel's mother, a nurse and a single mom, takes a very realistic stance as well. "He understands that he's handicapped. But he can't even imagine that someone might think that he's at a disadvantage because of it. I'm very appreciative that Meshi places as much emphasis on emotional support as on the myriad of therapies they're providing to strengthen Erel's body and mind." "From the minute the doctors first diagnosed him with CP, I couldn't imagine how to cope with this blow," Iris recalled. "I began searching for therapists and a framework for his rehabilitation and education, and I can't begin to tell you how things went from terrible to even worse. When we finally reached Meshi, they told me that Erel's condition was one of the most neglected they'd ever encountered. "Every day I am more grateful to Meshi for giving my son new life. I've searched the nation and I know that there is no other place like Meshi anywhere. 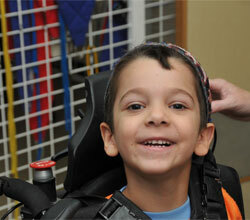 No other rehabilitation center was willing to take my child and love him and train him and make him thrive. This is his place, and we have been blessed to find it."